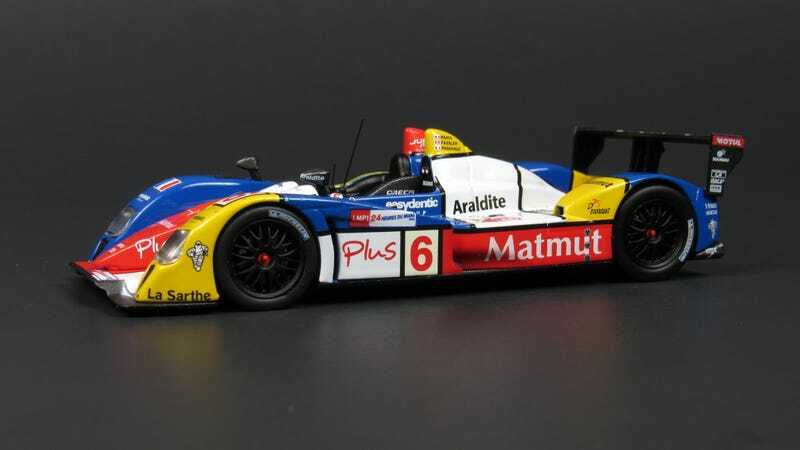 This is the Courage-Oreca LC70 run by Team Oreca-Matmut in the 2008 24 Hours of Le Mans, recreated by IXO in 1/43 scale. It was powered by a Judd 5.5L V10 and its performance in the race was absolutely unremarkable. But, as you can see, the livery is remarkable, and that’s literally the only reason I have this one in my collection. Driven by Marcel Fässler, Olivier Panis, and Simon Pagenaud, the car qualified 13th (overall and in class) and ended up with a DNF after 147 laps, finishing well behind the majority of the field. But that livery! IXO is a budget brand when it comes to collector grade 1/43 scale, but it’s hard to tell in these pictures. They’ve done a pretty decent job recreating this fantastic livery. The model does feel cheap in-hand and the gaps around the wheel wells are not really up to snuff, but overall this thing is pretty decent considering that it’s much cheaper than most high-end 1/43s. As you can see, they did a pretty fine job with the interior too. One thing IXO consistently does pretty well is carbon fiber. It’s not real carbon fiber, of course, but the textured plastic on this wing looks pretty good.